What can a memorial's inscription and list of names tell us about New Zealand communities 100 years ago? 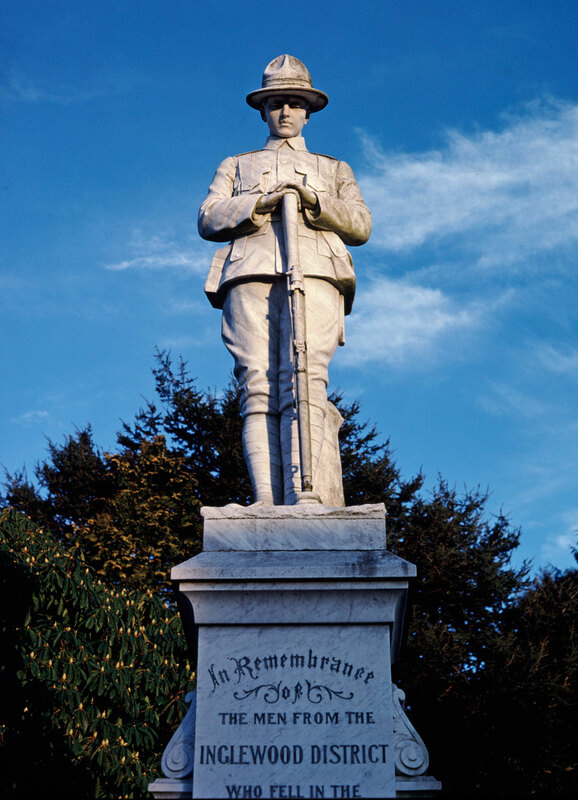 ‘The Glorious Dead’, ‘Lest we forget’, ‘Their name liveth for evermore’, are words familiar to those who have at some point stood before one of New Zealand’s 500 or so public First World War Memorials. Fundraising, which had begun during the war to support the war effort, continued as communities sought to provide a suitable way of honouring their dead. The local committees established after the war had to determine what these memorials would look like and what meaning they would convey through their design and words. These memorials served as de facto headstones for those who died so far away from home. The words inscribed had to both acknowledge the loss of so many as well as ensure this loss had some meaning and value. Jock Phillips talks of the blending of the seemingly contradictory sentiments such as ‘sorrow and pride’, the sense of loss tempered by the knowledge that they had died doing a great thing. A century later these sentiments may appear clichéd, or at odds with contemporary New Zealand and its thoughts on commemorating war, yet it appears these sentiments continue to resonate with some people. These memorials connected communities with events and places ‘over there’. Their design and inscriptions used drew heavily on the Classics, Christianity and symbols of the British Empire. The notion that the war was a critical step in terms of our emerging sense of nationhood is not apparent from these monuments with few referencing New Zealand history or traditions. There are a number in honour of ‘King and Country’ or with references to ‘Empire’ but there is a decided lack of New Zealand flags or recognised national symbols. Phillips maintains that these memorials were an affirmation of empire as opposed to proclamations of a distinctive nationhood. Māori language appeared on only two public memorials in Kaitaia and Whanganui while Latin appears on 29 memorials. And their glory shall not be blotted out. But their name liveth for evermore. The soldier on top of Inglewood's memorial. Image courtesy of Jock Phillips and Chris Maclean. Despite most memorial committees resisting the use of the Christian cross so as to be as inclusive as possible in their design, God was present in other ways. ‘To the Glory of God’, (as seen on the dedication stone at the National War Memorial in Wellington) was a relatively common inscription. Variations of ‘Greater love hath no man than this, that a man lay down his life for his friends’ (John 15:13, King James Version) appear on 27 memorials, typically with the last phrase is left out. The comparison with Christ’s self-sacrificing death was clearly designed to provide reassurance that a loved one had not died in vain but had instead played their part in a holy endeavour. They battled that we might be free. 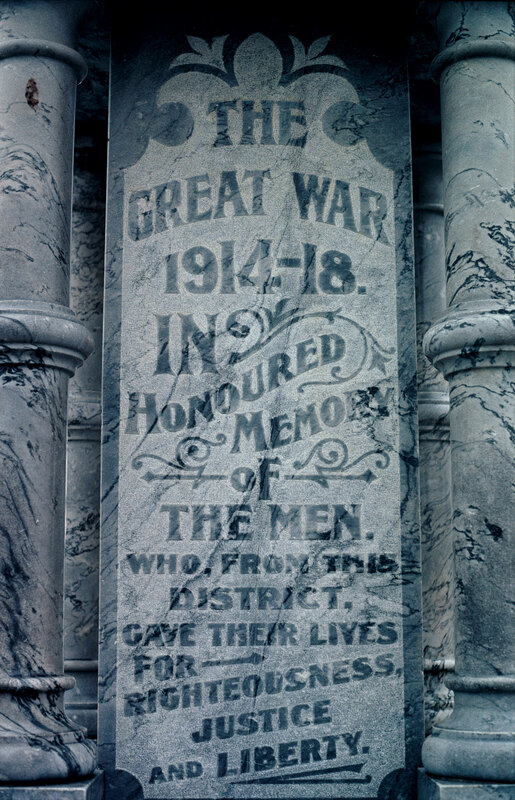 The text inscribed on Alexandra's First World War memorial. Image courtesy of Jock Phillips and Chris Maclean. 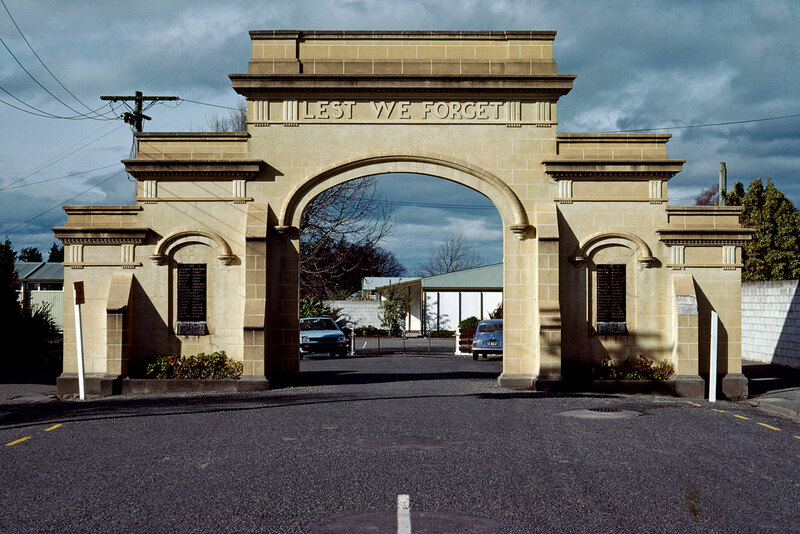 Whose names and how they would be displayed reflected a variety of practices, although the majority – over 80% – of New Zealand war memorials list only those who had died. This reflected the decision that from the outset many memorials were conceived of as surrogate tombstones to those who fell overseas. Compiling local lists usually saw community advertising for suggested names due to the fact that official records did not acknowledge men by place of origin. This approach relied heavily on friends and relatives responding to the call. This led to many instances of misspellings and omissions. Those who returned were sometimes remembered on honours boards in local halls, schools and the like. There were maybe 1000 or so such honours boards. That said, it was the memorial that became the focus of public service and acknowledgement, then and now. By contrast our Australian allies generally included the names of all of those who served on their memorials. This difference is partly due to our differing positions on the matter of conscription. After the introduction of conscription here in August 1916, roughly 20% of those New Zealanders who served overseas before the war’s end were conscripts. There was some sentiment that as not all men had served willingly it would be wrong to list them with those who were volunteers. The Australians, having twice rejected conscription, believed that as all who served were volunteers then it was right that all were recognised in this way. Memorials here that did choose to list all those who served typically indicated those who had made the ‘supreme sacrifice’. Methven's impressive memorial arch. Image courtesy of Jock Phillips and Chris Maclean. Names were usually listed in alphabetical order in an attempt to express a sense of there being an equality of honour. That said, 49 memorials chose to include the rank of the deceased which seemed to contradict the perceived egalitarian spirit of the New Zealand Expeditionary Force. A smaller percentage, a little over 10%, also noted any awards or decorations received. Sometimes names appeared in chronological order of their death. Nurses generally came at the bottom, along with names added later when relatives found their loved one had been left out. The building of memorials in the years following the war provides an interesting insight into how New Zealand society responded to the aftermath of the war. Their form, location and function were deeply symbolic. The words carved into them were also the result of much debate and thought. Looking at your local memorial, why do you think the post-WW1 community chose that particular form or those inscriptions? What were some of the ideas you think your community wanted to tell its future citizens through this memorial? What do you think your community might do differently now if faced with memorialising a similar event? What would a contemporary war memorial look like?